Midrash is quoted everywhere in Jewish sources, from Bible commentary to Jewish philosophy. Rabbis, students, educators, and scholars and refer to Midrash often, yet it remains little understood. Even those familiar with midrashic sources may have difficulty defining exactly what Midrash is or understanding the connection between a particular Midrash and the biblical text it discusses. Readers may also find certain midrashic sources disturbingly implausible, such as the talmudic description of the angel Gavriel affixing a tail to Queen Vashti (Megilah 12b). Are such accounts meant to be taken literally? If not, what are we to make of them? Learning to Read Midrash provides a systematic approach to Midrash study, addressing much of the confusion that attends this vital body of Torah knowledge. 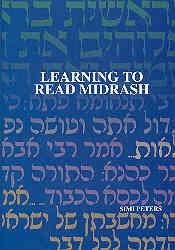 Drawing on a wide range of sources, Learning to Read Midrash defines what Midrash is, and explains how to approach it. Guided readings of midrashim provide the reader with models for interpreting a wide range of midrashic texts. ATID faculty member, Mrs. Simi Peters, the author of Learning to Read Midrash, has been teaching Tanakh and Midrash in Jerusalem for many years. Her eclectic, scholarly approach offers readers access to the fascinating world of midrashic teachings. Details: Hardcover, 310 pages, ISBN 965-7108-57- 8.